What do syndicates, Kickstarter campaigns, and AngelList all have in common? An all-star panel of angel Investors convenes to connect all of those dots and more in episode 639 of This Week in Startups. 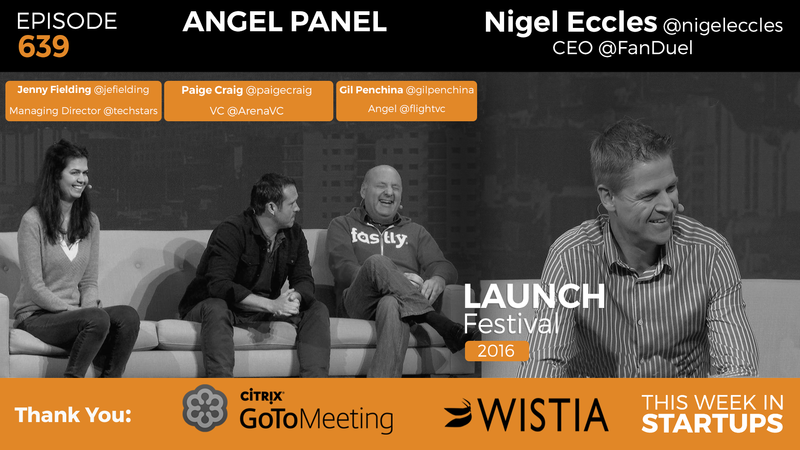 Gil Penchina of Flight.vc, Paige Craig of Arena Ventures, and Jenny Fielding of Techstars converge on the LAUNCH Stage at the 2016 LAUNCH Festival to hash out the trials and successes in the young and exciting field of Angel syndicates. Then, Nigel Eccles, CEO of FanDuel, uses real data to explain why daily fantasy leagues are gaining so much popularity. He also clears up the differences between gambling and fantasy sports. “A syndicate is basically a mailing list for money.” Gil explains how his AngelList syndicate works and the difference between an angel syndicate and a VC fund. He thinks of a syndicate as a “pop-up VC fund,” where the pressure to use the money collected isn’t as substantial, although the level of responsibility is just as high. The other thing that Gil really appreciates about the angel syndicate is the amount of investors in the collective. Gil’s fund, Flight.vc, involves over 3,000 angels supporting one another through intricate networks in addition to financial backing. Jenny shares the surprise that many of her founders experience as they find out how involved the process of fundraising actually is. The group then discusses the labyrinth of meetings that it takes to close a round, and how much effort is required just to get your funding. Meeting after meeting, and not just with different investors. Most investors want to see the traction a young company makes from one meeting to the next, and then another one after that, before finally deciding if they want to invest. Gil, Paige, and Jenny all have very different approaches to which companies they spend the majority of their time on. Gil and Paige are in agreement that they shouldn’t be spending any time collecting updates from their clear ‘winners,’ however, Gil likes to spend time on the losers and help bring them up to speed, while Paige feels like the losers are a lost cause, and would prefer to spend his time on the companies that he still believes in. Jenny, on the other hand, is immediately concerned if founders stop sending updates because it usually means that something is wrong. “Fantasy sports is a game of skill.” Nigel Eccles explains some of the state and federal laws that reinforce fantasy sports as a game of skill, and not just blind luck. This is a distinct, and very clear differentiation from gambling. While most sports fans spend the majority of time watching sports, Nigel points out that the majority of time spent by fantasy players is on research, away from the action. Last October there were some accusations about inside information being used by a DraftKings employee to win a large tournament on FanDuel. After further investigation, the evidence shows that this was not the case, it was simply a conflict of interest, which definitely doesn’t look good. Nigel explains how this incident, although no real harm was done, influenced his company to ban their own employees from playing on any competitor’s site. 1:19-1:51: Jason introduces the distinguished panel of angel investors to the stage. 1:51-4:44: Jason asks Gil about his lessons learned as the head of the number one syndicate on AngelList. 4:44-6:48: Paige explains the benefits of a traditional VC fund working in conjunction with an AngelList syndicate. 6:48-8:14: Despite all of the benefits to AngelList, Gil brings up one downside… you don’t necessarily want all your deals being done publicly. 8:14-11:09: Jenny shares her story from entrepreneur to angel investor to Techstars. 13:29-14:50: The group discusses the excruciating process of startup fundraising. 14:50-16:22: Is there more diligence involved on the investing side of AngelList than there used to be? 16:22-20:47: Jason brings up the issue of certain syndicate members making the “end run” to bypass the due diligence. 23:16-28:51: The group discusses the democratization of startup investment through crowdfunding platforms like Kickstarter and Indiegogo. 28:51-36:37: Jason asks each of the angels about their approach when they realize they’ve invested in a ‘loser’ company. 36:38-38:52: Jason and Gil share their few bad experiences with their angel syndicate. 38:52-40:22: Nigel Eccles, CEO of FanDuel, takes the stage and shares a marketing video for his company. 40:22-42:40: Nigel gives a rundown on the difference between traditional fantasy sports and daily fantasy leagues. 42:40-44:10: Some consider wagering money in fantasy sports is gambling, but in fact it is a game of skill. 44:10-47:03: Why FanDuel boasts an impressive Net Promoter Score of 63. 47:03-49:59: Jason observes that the NBA may be curating their business around the business of fantasy sports. 49:59-51:26: Jason and Nigel discuss Adam Silver’s controversial public stance on gambling. 51:26-52:08: Nigel gives a list of some of the giant media corporations who have invested in his company. 52:08-58:52: Jason addresses the elephant in the room… the multiple states in the US who are challenging the legality of daily fantasy leagues. 58:52-1:02:40: The DraftKings controversy and the lessons learned from it.